How many times have you said "yes" when you wanted to say "no" but guilt and "rules" got in your way? How many times have you said "no" when you wanted to say "yes" but fear stood in your way? How many times did you stand on the sidelines when all you wanted to do was jump in and play? Join us for a one of a kind journey to explore the lies we tell ourselves and the stories we have created about ourselves that have been holding us back from becoming the Warrior Women we are meant to be. Discover your true inner wisdom that will give you the confidence in yourself to propel you forward in your life. You will stop second guessing your decisions and feelings and believe that you can do it! Trust in yourself to make those crucial decisions required to lead a fulfilling, adventurous life. Give you the courage and commitment to face your fears full on and go after the life you crave. Find the answers to questions like..
Why is it so important to be both authentic and vulnerable? What is my next step to having the life I want? How can I manage my stress rather than letting it run me? You will discover the confidence to make things happen! Small group size so you aren't overlooked and you can't hide! Want your own thing? We offer a variety of workshops to help you find the one that best fits your needs. Whether it is a full day or half day or even an evening, we can customize a program to meet your needs and make it uniquely your own. Horses are more than just beautiful and majestic animals. For centuries horses and humans have been bonded together. They have carried us through life changing events, sacrificed themselves in wars, hauled us thousands of miles pulling our life belongings. All for our need to find ourselves and carve out a place for ourselves on this vast planet. Through all this, we missed what horses have truly given us. A mirror to look at ourselves from a deeper, truer place. They never judge us, degrade us nor expect us to be someone we are not. They simply accept us. Our true self. Not the face we put on for the world but what is truly in our hearts and deep inside ourselves. Because of their highly attuned and sensitive nature, they can hear and feel what is going on inside of us and then relate it back so we can see clearly what we have not been able to see before. They defog the mirror. 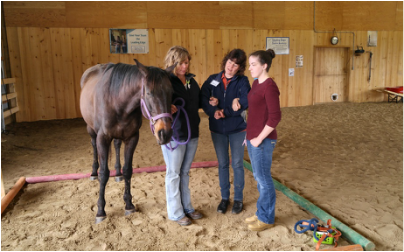 Partnering with a horse and allowing them to gift us with their intuitive knowledge allows us to change what we need to change right in the moment. We are given the opportunity to experience what true clarity, understanding, compassion, self-leadership and trust really feel like. We get to experience our true self. Horses walk us through the fear to the other side where beauty lies.